To view our current inventory of antique Royal Navy campaign medals, uniforms and acccoutrements, click here! This Rare Medal Has Been Sold. Thank you! One of about 600 issued! PRICE SOLD including shipping to the 48 contiguous States. 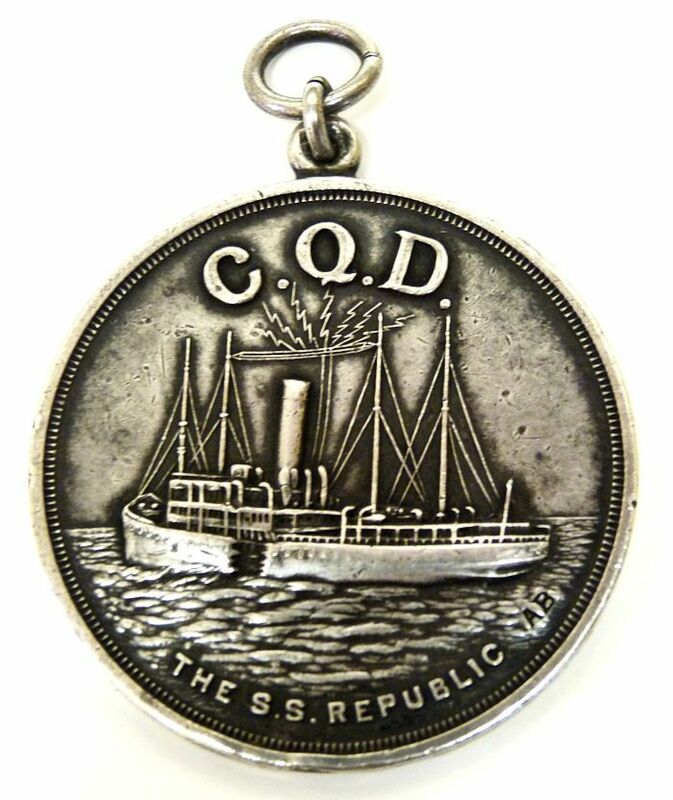 DESCRIPTION of this MEDAL: Round shaped medal bearing CQD over an image of the single stack ship RMS Republic and along the bottom the ships name and the initials “AB“ on the obverse. On the reverse,"From the Saloon Passengers of the R. m.s. Baltic & R.M.S. Republic, to the Officers and Crews of the S.S. Republic, Baltic & Florida", for Gallantry, commemorating the Rescue of over 1,700 souls, Jan. 24th 1909." The suspender is a simple ring without ribbon. Metal: Silver. Size: 45mm Clasps: Non authorized for this medal. Naming: Issued un-named but many were privately engraved. 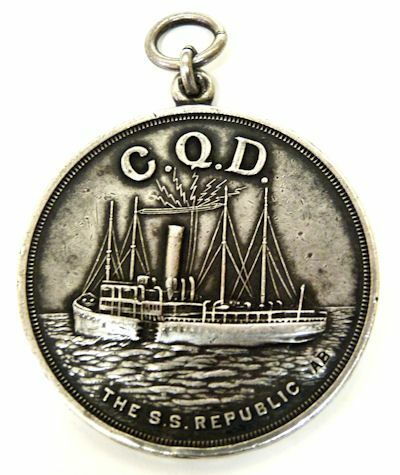 HISTORY: This 45 MM medal takes its name from the CQD emergency radio signal - predecessor of SOS and was issued unnamed. The CQD signal was sent out by the stricken White Star steamship 'Republic' after it collided with the Italian steamer Florida on 21 January 1909. The RMS Baltic, rescued 1600 passengers and crew from the stricken liner RMS Republic which was sailing from New York to Gibraltar and Mediterranean ports when it collided with the Italian liner Florida in fog off the island of Nantucket, Mass, Saturday, January 23, 1909. This was the first occasion on which the CQD distress call had been sent by wireless transmission. 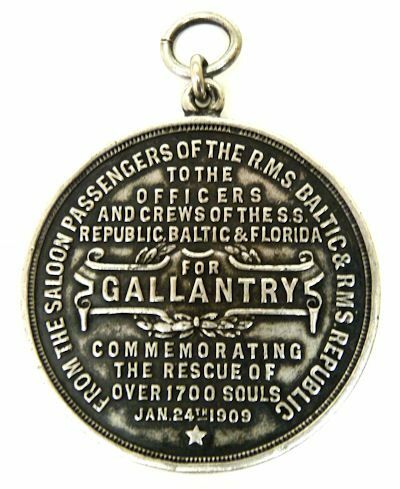 As a joint expression of the gratitude of saloon passengers from the White Star's Baltic and Republic, had medals struck in recognition of the gallantry of the seamen who had taken part in the rescue. The officers received silver medals, and the crew bronze medals. This medal is silver and is unnamed as issued. It is reported in the New York Times of November 5, 2009, that 97 medals went to the Florida, 240 to the Republic without mention of the number going to the Baltic. Whatever the number, it is estimated that no more then 600 medals were issued in total. CONDITION: The back of the ribbon has been glued to paper board and then to purple cloth, the remnants of which are present. These medals were issued without a hanging device and unnamed. The medal is in fine condition with a few tiny nicks front and back which are not of consequence. Otherwise the medal is in Very Fine condition showing handeling and has a nice patina of age.